Dear Blog readers, I am so pleased to say that one of you has been in touch with me and very kindly sent a set of scans from her beautifully preserved collection. Ruth has kept some unbelievably rare items – I hope I will be able to share them with you after I have lavished care and attention on their digital restoration. What a nice way to start the October posts! 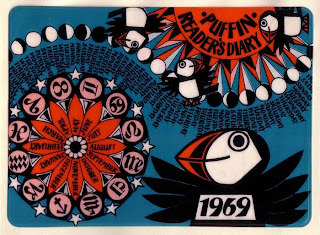 Here is the cover from the 1969 Puffin Readers Diary – Thank you Ruth!